These days with the economy still in the dumps, with the Justice Department still smarting from the mass U.S. Attorney firings during the Bush era, being a Bush loyalist isn’t something you want on your resume — particularly when your running for governor in a blue state. TRENTON — As early as 2005, the Bush Administration was ranking federal prosecutors by their allegiance to the president as well as their job skills — and then-U.S. attorney Chris Christie was considered one of most loyal, according to newly released documents. That determination, Democrats say, further cements the political ties between Christie, now the Republican candidate for governor, and former President George W. Bush, an unpopular figure in New Jersey. Posted: 8/13/09 at 4:24 PM under News Story. 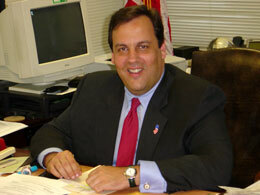 Tags: Bush loyalist, Chris Christie, Governor Race, N.J.